Climate change leadership is often mentioned in both news media and by politicians themselves, but what does it really entail? What kind of knowledge and skills will future climate leaders need to learn? What kind of political, cultural and psychological resources are lacking in present initiatives? This course discusses the fundamentals of an effective and functioning climate change leadership in a global perspective. Starting out from an analysis of how climate has changed during the planet’s long geological history and how it plays a central role in the life of the biosphere, the course looks at how these changes have affected different societies and how these societies have responded. Then the societal and cultural causes of climate change are discussed, looking at how the use of fossil fuel has transformed modern societies and cultures. With the knowledge gained during the first parts of the course, a framework for a working climate change leadership is critically looked at from a political, power and societal perspective. The last part of the course tries to apply the framework for a climate change leadership in case based workshops of future scenarios, on a global and local level, working with different strategies for mitigation and adaptation. Welcome to the course homepage for Climate Change Leadership! Information for the course will regularly be updated here. Please visit regularly to stay up to date. We are looking forward to an exciting semester with you! If you are a late applicant we suggest that you read through the Course Info folder found below. If you have any kind of questions, don't hesitate to drop by our office at CEMUS or write us an email at ccl(a)csduppsala.uu.se. Sanna and Friedi, course coordinators. Hansen, James C.(2011) Storms of my grandchildren: the truth about the coming climate catastrophe and our last chance to save humanity. New York: Bloomsbury. Hulme, Mike (2009) Why we disagree about climate change: understanding controversy, inaction and opportunity. Cambridge: Cambridge University Press. Klein, Naomi (2014) This Changes Everything: Capitalism vs the Climate. . New York: Simon and Schuster. As we are reading Storms of my Grandchildren it is also relevant to check out the updates to the climate science on James Hansen's website and blog, where you can also find loads of other presentations, videos, and information that he has contributed to. Excellent source of information! 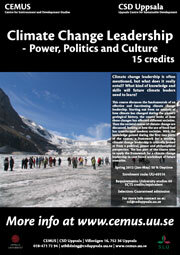 ...to Climate Change Leadership - Power, Politics and Culture course, Spring 2015! Monday, January 19th at 13.15 in room 21:136 at Blåsenhus, von Kraemers Allé 1. You must attend the registration if you want to take the course. Don't hesitate to contact us at ccl[at]csduppsala.uu.se if you have any questions. PS. If you are interested in negotiations you might consider signing up for the Uppsala Model United Nations from Feb 26th - Mar 1st. This year's theme is "Crossing Borders".